Slots featuring mechanical reels have been featured by casinos for decades. Till today, the one arm bandit has a considerably large following of loyal slot enthusiasts, especially in the US, UK and Australia, where slots are the most played games in any casino. With the mechanical slots, designers can do very little with the format because of the many moving parts that make up mechanical slot machines. In this chapter we are going to discuss how mechanical slot machines have evolved through the ages and what slot designers and programmers have been able to do with the slot games in terms of design and the odds that are offered which lead to a desirable outcome for the players. Whether at the casino or online, most modern day slots are played in video screens. But that hasn’t lessened the popularity of slot machines that feature mechanical reels, especially the slots featuring the traditional three reels. The only difference in today’s mechanical slots is that the reels are driven by software programs that are similar to the video slots. But, there are few things that the player has to understand before they start playing. The results of modern-day slot machines are determined by a random number generator. The symbols that are displayed on the virtual reel are mapped by the game programmers. The frequency at which the symbols appear on a single payline is not in proportion with the number of symbols that show on the physical reels. 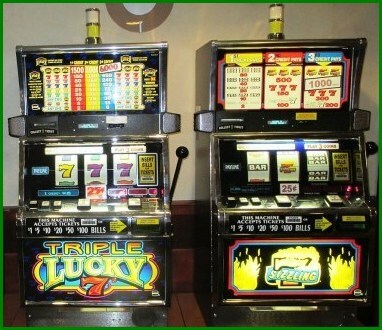 Slot machines which feature mechanical reels usually offer a higher payback percentage. The payback percentage doesn’t necessarily correlate to the percentage of winning spins. For decades casino slot machines used a system that determined each game’s payback percentage based on the number of symbols on the reels and the payoff on every winning jackpot. That all has changed with the arrival of modern slot machines and especially video slots. Nowadays, a random number generator determines which symbol appears on the virtual reels. Random number generators use complex algorithms to calculate the numbers that appear on the slot reels. The computerized random number generators are extremely fast and are able to generate hundreds of numbers at random in a second. These random number generators keep on working even when the slot machine is not being played. Since the random number generator uses a full set of numbers, getting the same results more than once is possible, although it does not happen. While game programmers use the random number generators to come up with numbers randomly, the software does not know who the numbers are used, and the exact outcome once the virtual reels stop spinning. The exact amount of random numbers that are used in each slot machine and the way they are mapped out differ from slot to slot. Since the random number generators are getting more and more sophisticated, the algorithm can begin from multiple points once the player had pulled the handle or pressed the button on their slot machine. And since these random number generators are extremely fast, even a pause for a second can change the result of the spin. While this doesn’t mean that the result you get will be better or worse, it does mean that the numbers that are generated are going to be different, as compared to if you had kept the pace. What this means that if the player after you hits the jackpot on the slot machine you were playing it does not mean that you would have won that jackpot if you had continued to play. Using the virtual reel makes it possible for the slot to generate a wider range of outcomes as compared to the odds being determined by the number of symbols and spaces on the slot machine reels. While earlier slot designs build slot machines with 20 and 30 symbols and spaces instead of the initial 10 symbols and 10 spaces, to drive the odds higher would require a large amount of combinations which was not possible with the mechanical slots. By mapping the symbols and spaces of the traditional slot machines onto a virtual reel meant that the amount of combinations could be increased significantly, making the large jackpots possible. Let’s take a closer look at the way virtual reels work in comparison to the traditionally used mechanical reels. With the odds being determined by the mechanical powered reels the chances of lining up the winning combination which is for example 7-7-7, was 1 in a thousand. This meant that the jackpot of the slot machine could not be very large. In slots that were using the three symbol combinations it would still be extremely difficult to come up with a large jackpot of a few hundred coins. But, by mapping those same symbols and stops on the mechanical reels on to a virtual reel the chances of hitting the jackpot are 1 in 125,000. The modern virtual reels on the video slots make it possible for a jackpot of thousands of coins, along with significantly increasing the paybacks on the other symbols as well. This means that slot game developers are able to provide players with games that are less volatile since they now have the capabilities of creating smaller jackpots and can also increase the paybacks on lesser wins. The introduction of virtual reels on video slots machines of today makes it easy to adjust all variables, making room for many possibilities. As compared to the traditional slot machines that did not give much space to the developers to make large jackpots possible with the modest number of 1,000 combinations. The random number generator is able to process numbers continuously even when the slot machine isn’t being played. 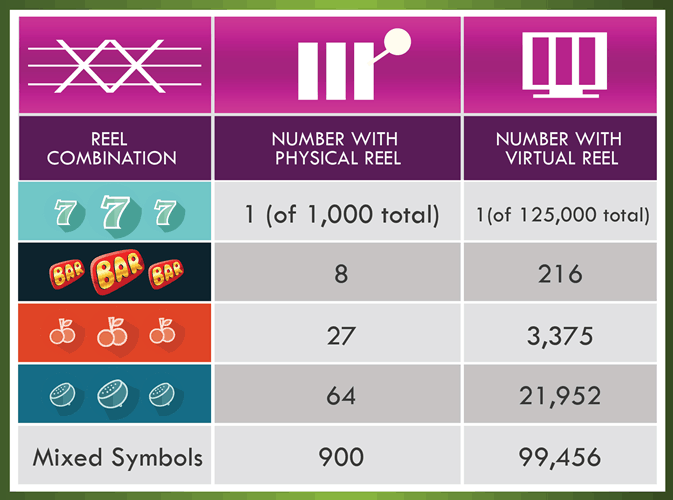 The symbols and the spaces in all modern slot machines are determined by using a combination of a virtual reel and the random number generator. The ability of the random number generator to work continuously means that any change in the payer’s timing will result to a totally different result on the reels. By increasing the number of possible combinations on the virtual reels, programmers are able to design slot games with larger jackpots and more create more variations in their payoffs, this takes the excitement of playing the slots to a whole new level. The payback percentage is that proportion of the total wagers that are returned to the player as winnings whenever they hit a jackpot or are rewarded by getting any of the other symbols. A hit frequency, on the other hand, is the proportion of the total amount of spins that go into rewarding the slot machine player. We can get a better idea of both these concepts by imagining two separate slot games that have similar pay tables but have hit frequencies that are both very different. If the two slots were placed beside each other, they would appear identical to the onlooker. Both would be displaying the paybacks to the winning combinations, which would both be identical. This would make it extremely hard for any player to tell the difference between the two slot machines’ hit frequency and their respective payback percentages. Now, let’s make things interesting. What if the slot developer wanted to make a slot machine that has a hit frequency of a particular slot game but the payback percentage of another slot? One way to get this result is by making adjustments to the pay table. As you can see that the hit frequency in Game A is still at 13.36% while Game B is displaying 10.5%. The payback on the cherries symbol changes from 120 on Game A to 80 in Game B. In the end, Game A has the highest payback percentage, while Game B has the highest hit frequency. One can see that the large payoffs on the cherries symbol is enough to get a 95.38% payback percentage for Game A, while Game B is down to 88%. So, the slot machine with the highest hit frequency is the one that pays lowest. With this example it seems that the player is able to tell which slot machine is the highest payer, since Game A pays more on the cherries symbol both times and has a higher payback percentage as well. 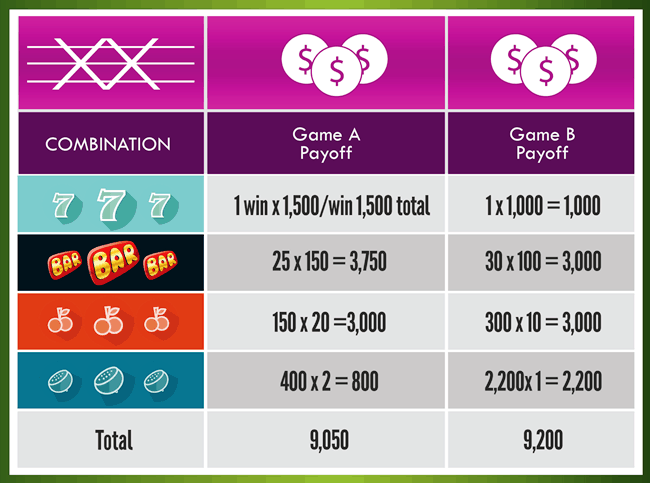 In the diagram above Game A pays more on the cherries symbol and has a better payback percentage, making it appear to be the higher payer as compared to Game B. But, appearances can be deceiving. By looking at another example we can get a better picture of which game offers a higher winning combination. Again, we will be using the example of 10,000 possible reel combinations. At a glance, here Game A appears to look like a high payer since it is paying 1,500 as compared to the 1,000 offered by Game B. on the three 7s, Game A is paying 150 as compared to 100 by Game B, and 20 on the bar symbol as compared by 10 on Game B. The reality however, is very different from what meets the eye. For instance, the hit frequencies on the slots have also been changed, with Game A now with a hit frequency of 5.76%, as compared to Game B which has a 25.31% hit frequency. The first thing we see is that Game A pays out a payback that is lower as compared to Game B. We also see that Game A only has 400 winners with the melon symbol while the payback is double to the initial bet, while in Game B the payback with the melons are equal to the size of the bet. With such a large amount of spins that are paying low in Game B, it is easy to see that it has a low volatility. This also is the cause of extending the game play. The slot games that have such a large difference when it comes to hit frequencies with a small difference in payback percentage shows us of the amount of flexibility the slot designers are allowed to have while designing different slot machines. Even if both slots used different combinations, the two games would have almost identical percentages when it came to paybacks, but would be totally different gaming experiences. This makes Game B the better choice for players who want to extend their game play duration while Game A is the best choice for those who want to win big. When it comes to the 3-reel mechanical slots, the hit frequencies are normally around 5.76% and can go all the way up to 25.31%. The games that feature more paylines usually have higher hit frequencies. Contrary to popular belief, slot machines aren’t that simple to design. The following are some of the factors which determine the winning combination. The examples that have been provided above is to help elaborate these principles, which is that the real mechanical slots that use real math are considered to be complex as well, but not as complex as the modern slot machine. Most of the modern slot machines featuring 3 reels feature more than just a single payline. Most 3-reel slots feature bonuses. Mechanical slots that feature 3-reels have gained a niche in the casinos. The slots that feature multiple paylines offer far more possibilities of winning combinations while adding to the complexity of the algorithms. Modern slot game designers are able to use three lines across the screen including two diagonal lines. More lines can also be added by creating zigzags or Vs which are designs that are very similar to the video slots. More recently, game designers have been able to make 3-reel slots that feature as many as 27 paylines. Even bonus games complicate the algorithms that are used in these slots. But regardless of that fact, there are many 3-reel slots that feature bonus wheels, free spins and secondary screens that creates the illusion of a mechanically powered slot machine. Since bonus games are such a big part of slots, their payouts also need to be included when calculating the overall returns of a slot machine. The rate of hit frequencies doesn’t necessarily mean that the payouts are going to be higher. Slot game designers use a combination of both paybacks per win and hit frequencies to determine the payback percentage. Even those slots which appear to be high paying can be low paying if as compared to a slot with a lower pay table. The latest mechanical slots feature multiple paylines and use a total of five reels rather than three, along with bonus events as well.